14ymedio, Yoani Sanchez, Havana, 9 August 2018 — For some time it has been clear that the next steps in Michelle Bachelet’s career pointed to an international organization. With her political path closed in Chile, where as president her popularity hit historical lows, she is now poised to occupy the Office of the United Nations High Commissioner for Human Rights (ONCHR), as announced this week. Bachelet’s appointment to the head of the ONCHR comes as no surprise given that her name was mentioned as a potential leader of the UN after the departure of Ban Ki-moon. Although her new responsibility has yet to be ratified by the General Assembly, the Chilean is very likely to occupy the United Nation’s most important position in the field of human rights. Although both are based in Geneva (Switzerland), the ONCHR should not be confused with the Human Rights Council, which is a political body made up of the representatives of UN Member States. The ONCHR on the other hand, is a supposedly independent organization staffed by more than one thousand employees. Bachelet assumes that position in a complex moment in which violations of citizen rights are rising in tone in many countries and the United Nations is experiencing a period of fragility, derived from its inaction, the manipulation of its mechanisms by authoritarian regimes and the little credibility it enjoys among democratic governments. Her record will not help her much in this ecumenical endeavor. During her two presidential terms Bachelet demonstrated that she may suffer from an obstinate myopia when it comes to the excesses committed by her ideological colleagues who rule in Venezuela, Nicaragua and, above all, in Havana’s Plaza of the Revolution. In the long years she was in charge of the solid Chilean democracy, her criticisms were rather lukewarm or nonexistent towards the leftist populisms that repressed their dissidents. With a few exceptions, the president preferred not to annoy her fellow utopians and opted for the strategy of looking away. A few weeks before handing over the presidential sash to Sebastián Piñera, she arrived in Cuba on a trip that could only be understood as that of the practitioner of a creed to the temple from which it spreads its doctrine. Although both countries’ official spoke of a visit to strengthen commercial ties, in reality that visit had all the traces of a renewal of support Castroism. The appointment of a friend of the Plaza of the Revolution to a position much coveted by Havana is not the result of chance. In it we sense the influence of Cuban diplomacy and its ability to move in the UN corridors, applying pressure, buying loyalties and votes, to pave the way to make the Chilean president to the High Commissioner for Human Rights. The appointment of Bachelet is a magnificent opportunity for Havana because it needs international support to compensate for the weakening of its regional alliances within the Bolivarian Alliance for the Peoples of Our America (ALBA) and the Community of Latin American and Caribbean States (CELAC). It is also an opportunity for Havana’s allies, who are experiencing difficult moments and doing everything possible to avoid international condemnations for their repressive actions. This is the case for Nicaragua, where Daniel Ortega, the former guerrilla turned Caudillo, has met popular revolts with fire and. Something similar is happening in Venezuela, which is experiencing a terrible humanitarian crisis while the Miraflores Palace resorts to a more aggressive, exclusive and disparate discourse. In Cuba itself, the organizations of the United Nations system tend to align themselves with the Government instead of taking note of the denunciations by citizens against the iron control of the Communist Party. Can this change with the appointment of the former Socialist president at the head of the ONCHR? If she hasn’t done so before, why would Bachelet now criticize her old friends in olive green? Why would she denounce acts of repudiation against dissidents, arbitrary arrests or the control exercised by the authorities over the lives of millions of Cubans? 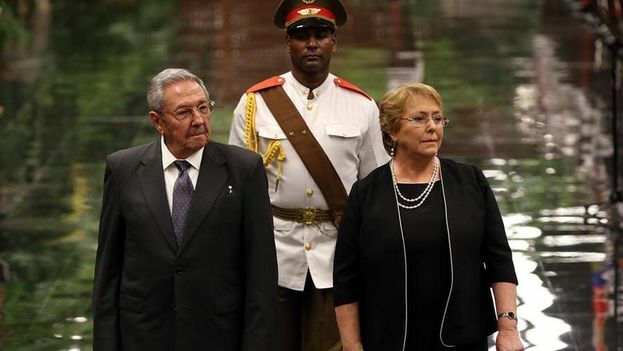 Instead of speaking out about the violations of the political rights of an entire population, Michelle Bachelet has dedicated herself for many years to extolling the supposed achievements in Cuban healthcare and education of which barely a mirage remain. There is no reason to think that she will change her discourse from the UN watchtower. She can always justify her silence and her inaction with the argument that she is very busy with the multiple complaints that will come from so many other places on the planet.